The Caroline collection by Jennifer Taylor Home is the perfect addition to any living space looking to add a bit of a traditional flair. The fabric selected for the collection features Polyester blends and engineered for long life. Our wood frames are made from kiln dried birch wood which provides exceptional support and stability. This unique design is accented with hand tufts along the back and hand applied nail head trims along the recessed arms. The Caroline is an ideal choice for your living room, den, office, or any living space you prefer. 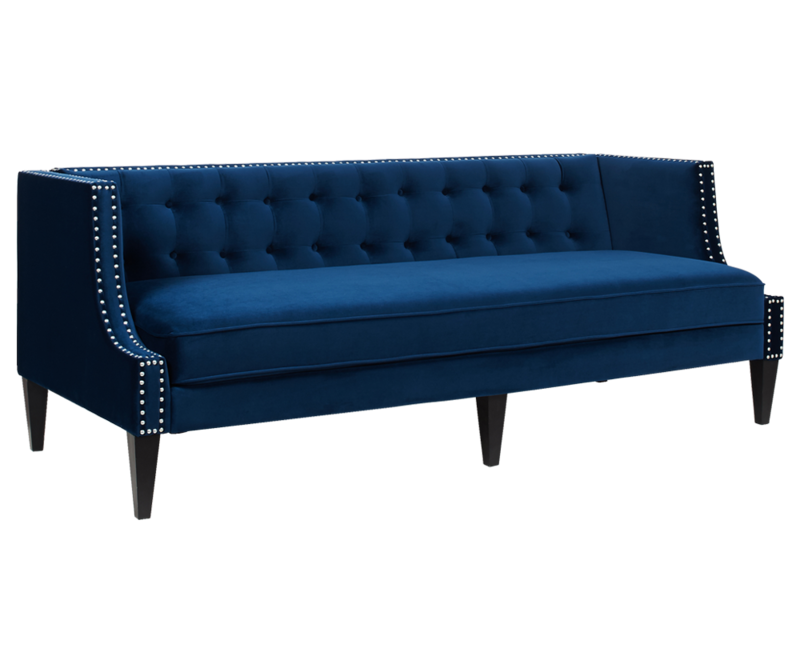 This 3-seater sofa brings class and lounging comfort to any room in the home. We offer a unique versatility in design and make use of a variety of trend inspired color palettes and textures. Our products bring new life to the classic American home. 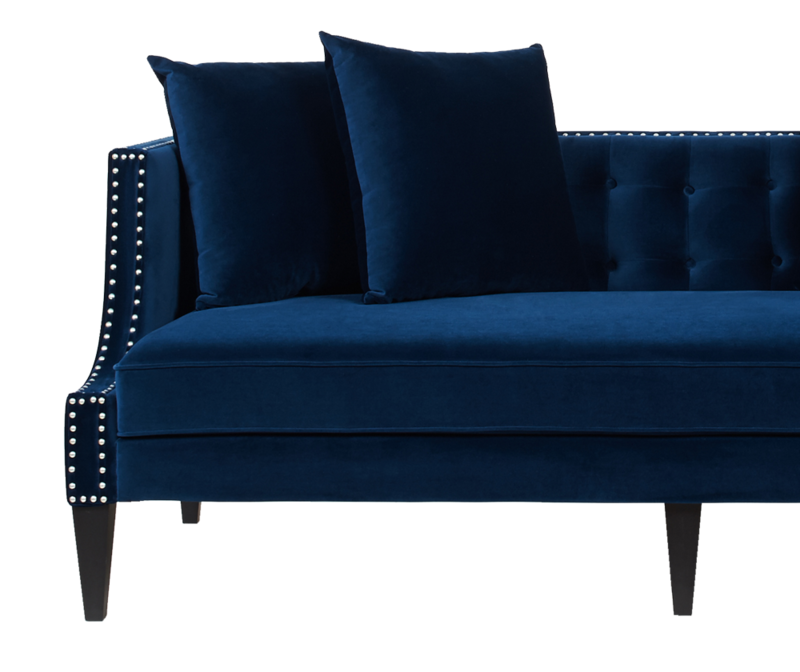 The Caroline Recessed Tuxedo Sofa is beautifully engineered with wood frames made from kiln dried birch wood. This brilliant architecture is a unique design with hand tufted buttons along the back and hand applied nail heads along the recessed arms. This 3-seater sofa brings class and lounging comfort to any room in the home. Four stylish pillows are included for comfort while giving this sofa an alluring style. Comes in a variety of five different colors to choose from. It is well constructed and elegant. This sofa is pretty but definitely was not the color I expected. I ordered the sofa in grey but it looks different than the picture online. I expected a dark grey but it is more of a greenish grey color. I am very happy that it is exact as pictured and more important is the quality of the sofa. The seating is also pretty deep which is great because it allows for very comfortable seating. I really like my new sofa. Beautiful addition to my living room. I put it in my formal living room so it's perfect for get togethers. It replaced a bulky couch I had and this looks sleek and chic. This couch is beautiful! Only need to screw the feet in very easy and looks fantastic! This couch is a wonderful addition to any home. It is comfortable, looks great, has a light footprint for the amount of seating space it gives. Delivery was difficult because we had a narrow hall and doorway but we were able to maneuver it into place. Elegant and classy. Love this sofa. Everything I was looking for, Modern and glam. Very beautiful color and comfortable.